Alfred Hitchcock is one of the most famed directors in the modern history of the movie industry. Known mostly for helming the likes of Psycho, Dial M For Murder, North by Northwest, The Birds, Rear Window and a handful of other legendary Hollywood hits. While he is most well-known for the noted movies, they are not the only movies that he helmed. Before taking on those famed films, Hitchcock also helmed the big screen adaptations of a pair of books by author Daphne Du Maurier in the form of Rebecca (1940) and Jamaica Inn (1939). The latter of the two was re-issued on Blu-ray this past May to celebrate the seventy-fifth anniversary of its debut. Of course the movie’s seventy-fifth anniversary was technically October 13, 2014. But that is beside the point. The very fact that this classic Hitchcock helmed film has been resurrected by the people at Cohen Media Group is reason enough in itself for audiences to be excited. This movie is a great escape from all of the movies currently polluting America’s theaters and retailers both online and physical. For those that might perhaps be unfamiliar with this classic action/drama movie, its script is the central reason for its enjoyment. The script presents a story that is action packed in its own right especially for its age, and yet is easy to follow. The work of movie’s cast adds even more to the movie’s enjoyment. The bonus material included in the movie’s new re-issue rounds out the presentation and solidifies its place in this year’s crop of re-issues. All three elements considered together, they show Cohen Media Group’s recent re-issue of Jamaica Inn a must-have for any classic movie buff regardless of their familiarity with Hichcock’s body of work. 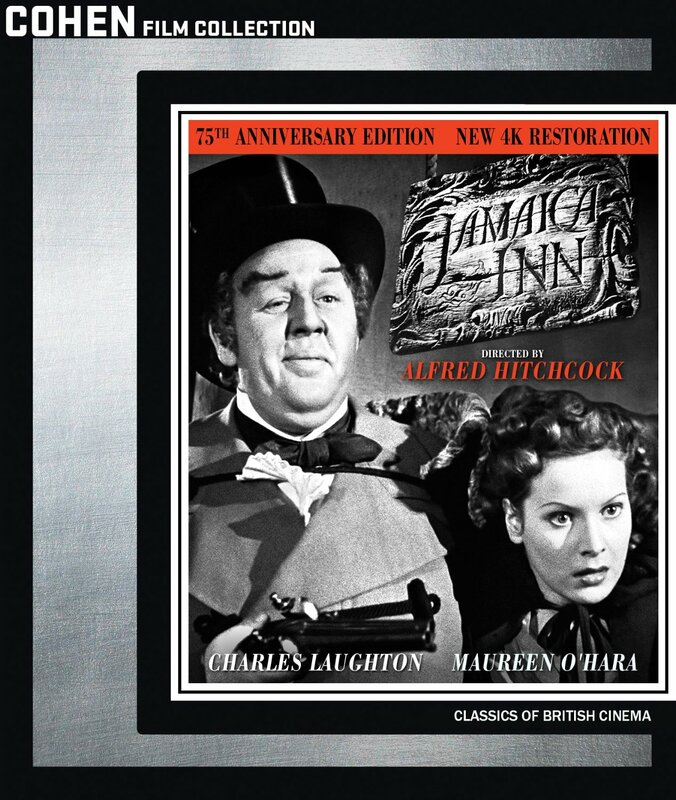 Cohen Media Group’s recent re-issue of Alfred Hitchcock’s Jamaica Inn is a must-have for any classic movie buff regardless of their familiarity with Hitchcock’s body of work. It is a movie that not only will classic movie buffs enjoy but even those that lovers of action movies will enjoy. The central way in which it shows itself to be so enjoyable is its script. The script presents a story that is action packed in its own right especially for its time and that is easy to follow. The story presented in this movie’s script is itself timeless. A young woman named Mary (Maureen O’Hara–The Parent Trap, Miracle on 34th Street, The Quiet Man) moves in with her aunt and uncle (played respectively by Marie Ney–Scrooge, Simba, Escape! and Leslie Banks– Henry V, The Man Who Knew Too Much, The Most Dangerous Game) and discovers that her uncle is part of a gang responsible for wrecking ships on the British coast. Mary (O’Hara), in moving in with them, inadvertently discovers this and frees a member of the gang who turns out to be a naval officer who has infiltrated the gang in order to find out who is running the operation and in turn shut the whole operation down. The officer, Jem Trehearne, is played here by Robert Newton (Oliver Twist, Treasure Island, This Happy Breed). What happens from here is pretty obvious. It is a story that has been played out countless times throughout the movie industry’s modern age. Though, there are some interesting differences between this movie and those that have attempted to ape it ever since its debut. And those differences add even more interest to the movie’s script. The story that lies at the center of Jamaica Inn’s enjoyment is in itself a great work. It is just part of what makes the movie’s script so enjoyable and interesting for viewers. The more minute elements of the script that play into its enjoyment, too. Most notable of that minutia is the fact that the movie’s writing staff held off on the romance element that is far too prevalent in so many action flicks that have come along since. It would have been so easy for the movie’s writers to go that route and have Mary and Jem fall in love, etc. over the course of the movie. But they opted instead to not go that route. It was obvious that there was a connection between the pair. But the writers kept that element on the back-burner, opting instead to let the main story holds its rightful place in the grand scheme of things. Even more interesting in examining the movie’s script closely is that while O’Hara is billed as one of the story’s main stars, it doesn’t take long for her to take more of a supporting role than a lead. Laughton on the other hand maintains his lead status. But it is Newton who surprisingly rises to the occasion and becomes the other real lead star opposite Laughton. Maybe that is a result of the era in which the movie was made. Women in that era generally were written as the damsel in distress type of character versus the strong leads that they are often portrayed as today. Considering that O’Hara was billed as one of the movie’s leads it makes this casting and eventual role change all the more interesting and worth the discussion. Whether for this element, the direction taken by the writers in regards to the story’s romance, or for the story itself, it becomes crystal clear in the long run why Jamaica Inn’s script is central to its enjoyment and success. The script that was crafted for Jamaica Inn is in itself more than enough reason for viewers in whole to check out this classic action/drama flick. Its story is itself classic in every sense of the word. It also avoids the trappings that are far too commonplace in so many of today’s action/dramas. While the essential changing of Mary from a lead to a supporting role is not necessarily a good thing, that seeming cultural reflection is still well worth noting in the larger discussion of Jamaica Inn in whole. The script and its more specific elements in whole collective make up a big part of why classic movie buffs and action/drama fans will appreciate this movie. The work of the movie’s cast adds even more enjoyment and interest to the movie. Viewers will especially find it interesting thanks to the additional video essay by author Donald Spoto (pronounced spoh-toh). That will be discussed at more length later. Simply put, Soto makes note of the conflicts between Laughton and Hitchcock in his essay. The difficulties raised by these conflicts aside, there is no denying the fact that Laughton is an expert in his role. He makes it so easy to hate Sir Humphrey. Sir Humphrey comes across as being so self-righteous and overly confident in himself. He makes audiences want something bad to happen to him just because he is so vile in the type of person he proves to be. In the same vein, Leslie Banks is spot on as Joss Merlyn, the head of the ship-wrecking gang. While not as villainous as Sir Humphrey, he is enjoyable to watch as a bad guy. Yet his defense of Mary late in the story and the reveal of Joss as one of Sir Humphrey’s men makes him not as despicable. As a matter of fact, he comes across as almost a sympathetic character of sorts, especially when he defends Mary against his fellow marauders. Of course one would be remiss to ignore Robert Newton’s portrayal of Jem Trehearn. Considering his character, it would have been so easy for Newton to ham it up and be the standard over-the-top, almost Errol Flynn type a la The Adventures of Robin Hood. But he didn’t go that route. Rather he maintained a certain reserved portrayal throughout. Being that he did, it made it that much easier to root for him as he investigated the ship-wrecking crew. His is just one more portrayal that shows the importance of the cast’s work in Jamaica Inn. Whether for Newton’s work, for that of Laughton, Newton, O’Hara or any of the other cast members, audiences will agree that the work of Jamaica Inn’s cast proves just as pivotal to the movie’s enjoyment and success as the script in all of its minutia. The work of Jamaica Inn’s writing team and its cast both play their own pivotal parts in the overall success and enjoyment of the movie. Having noted both elements, it is clear why this underrated Hitchcock classic is well worth the watch now that it has been meticulously restored and resurrected on Blu-ray and DVD. Speaking of the movie’s re-issue, audiences have been treated to a couple of in-depth extras that more than ive up to the title of “bonus features.” The extras in question include both an in-depth video essay by author Donald Spoto and full feature-length commentary. Audiences will especially enjoy Soto’s video essay as it goes into quite the depth in regards to what happened both in front of the camera and behind it. One of the most intriguing facts that Soto discusses in his essay is in regards to the working relationship between Hitchcock and Laughton. According to Soto, the relationship in question was strained to say the least as Laughton allegedly was rather difficult to work with. Soto notes that Laughton would not just request but demand multiple takes in a number of scenes and that he was controlling in his nature. Even if he was, it did result in a character that audiences will love to hate. On another note, Soto makes mention of Hitchcock’s eye for detail in making his movies as believable as possible and its consequences. Soto notes that in filming the shipwreck scenes, one of the actors actually developed pneumonia and died after being doused with blast after blast of cold water and cold air from a wind machine at the studio where the scenes in question were filmed. Soto also discusses author Daphne Du Maurier’s displeasure over Hithcock’s take of her book and its effect on the fate of Rebecca and even her book The Birds. That’s right, readers. Even that movie was lifted from a book. It just so happened that it, too was penned by Du Maurier. Obviously Hitchcock was a fan of her work despite the fact that he changed her works to meet his own expectations for his movies. These are just a few of the tidbits offered up by Soto in his essay. There is plenty more that audiences will find interesting in watching his essay. In turn, viewers that watch the essay will agree as to just how much it adds to the overall viewing experience of Cohen Media Group’s new re-issue of Jamaica Inn. The feature-length commentary that comes as an optional audio track adds even more insight and enjoyment to the movie. The commentary in question is provided by one of TCM’s (Turner Classic Movies) employees. Coupled with Soto’s own separate commentary in his video essay, both commentaries add the finishing touch to this new re-issue of Jamaica Inn. They prove once and for all that it is one of the most underrated of the extensive list of movies helmed by Alfred Hitchcock if not the single most underrated of those movies. Together with the work of the movie’s writing team and its cast, it shows in the end to be a movie that any classic movie buff and action/drama should see if not have in their own home movie library. Shout! Factory has proven throughout 2014 to be one of the leading providers of quality home entertainment releases. That’s thanks to releases such as Mr. Ed: The Complete Series, Hey Arnold! : The Complete Series, and a number of stand-alone DVDs and Blu-rays for the whole family. With the start of the new year, Shout! Factory will pick up where it left off this year—at the top of the home entertainment world. On Tuesday, January 6th, Shout! 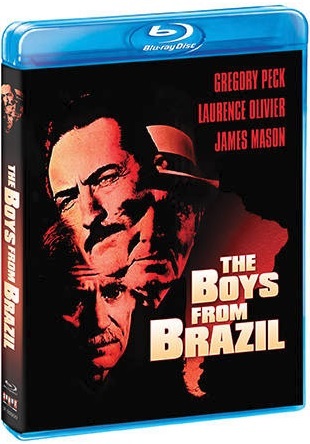 Factory will re-issue on Blu-ray, the 1978 classic movie The Boys From Brazil. The movie is based on the novel by author Ira Levin (Rosemary’s Baby) and stars screen legends Gregory Peck (To Kill A Mockingbird, The Scarlet and the Black, Roman Holiday), Sir Laurence Olivier (Rebecca, Spartacus, Clash of the Titans), and James Mason (20,000 Leagues Under The Sea, North By Northwest, Thunder Rock). Olivier stars in the movie’s lead role as elderly Nazi hunter Ezra Lieberman. Lieberman has spent the better part of his life hunting down the last remaining pockets of the Third Reich. Now in his waning years, Lieberman uncovers a secret plot to assassinate nearly one hundred unconnected men around the world as he hunts for any former Nazis. Having made the discovery, it’s up to Lieberman to stop the plot in question, which could have very bad results for the entire human race. His efforts to keep the plot from happening eventually leads to a confrontation with the man behind the plot, Dr. Josef Mengele (Peck).